The marquee of the Orpheum Theater. Please note that this image was manipulated in order to reflect encounters described within the article. Madison’s Orpheum Theater has proudly preserved its identity into the 21st century. 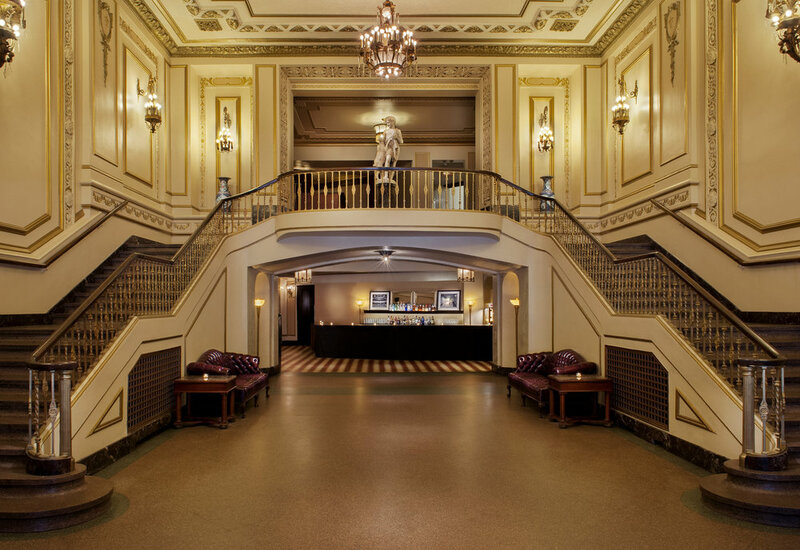 The building’s limestone, art deco exterior and French renaissance interior harken back to its inception in 1926; the theater’s flashy grand staircase and gaudy chandeliers remain as a testament to the era of vaudeville that birthed it. The Orpheum takes its name from the Greek hero Orpheus, and his statue still overlooks the theater’s entryway. Orpheus, of course, was a champion of music and poetry, a trait he shares with his namesake theater. But few can forget the tragedy of Orpheus, and the tale of his lost love Eurydice, for whom he traveled all the way to the Underworld. The Orpheum was named very appropriately, then, because like the tragic hero from which it takes its name, it too has a connection to the underworld—the Orpheum theater is said to be haunted. Emily and I meet our friend Lisa in the appropriately dim and eclectically decorated Weary Traveler Freehouse; its dark wood interior and weird, kitschy wall hangings provide the perfect backdrop for our conversation. We’re looking for ghost stories about Madison’s Orpheum Theater, and our resident gothic ghost tour guide is the perfect woman to provide them. She begins by telling us about Matt, a contractor hired to help renovate the building. Matt is an established professional with a level head and a logical mind—not the type of man to make up ghost stories or imagine things that go bump in the night. Naturally, that makes what he had to say about the Orpheum’s furnace room even more startling. There is an eerie presence in that area of the theater, capable of unsettling a man as practical as Matt. He never could explain the feeling of dread that space evoked, and it haunts him to this day. A man like Matt needs to be able to explain things, but there’s just no explanation for why he’d be so irrationally afraid of a simple furnace room. Now, that might be dismissed as one man’s imagination, but he’s not alone. Lisa goes on to tell us the tale of a second man who witnessed a similar effect. Bill and his wife were visiting the Orpheum when they decided to use the restrooms downstairs. There is an octagonal waiting room outside of the lavatories, and Bill was waiting patiently for his wife to finish when he was suddenly overcome by a wave of nausea. The feeling was so overpowering that he slumped to floor, and he was still sitting there when his wife exited the bathroom, clearly distraught. “We need to go, right now,” said Bill’s wife as she hurriedly left the lady’s room. She was obviously upset, as though she’d seen or experienced something frightening. She didn’t tell him what, though, and he was miserable enough at the time not to ask questions. Whatever frightened her and caused Bill’s mysterious sickness remain unexplained, but it certainly seems like the Orpheum has a penchant for making certain patrons uncomfortable. These tales by themselves might not be enough to warrant suspicion of supernatural shenanigans, but they don’t exist in a vacuum. 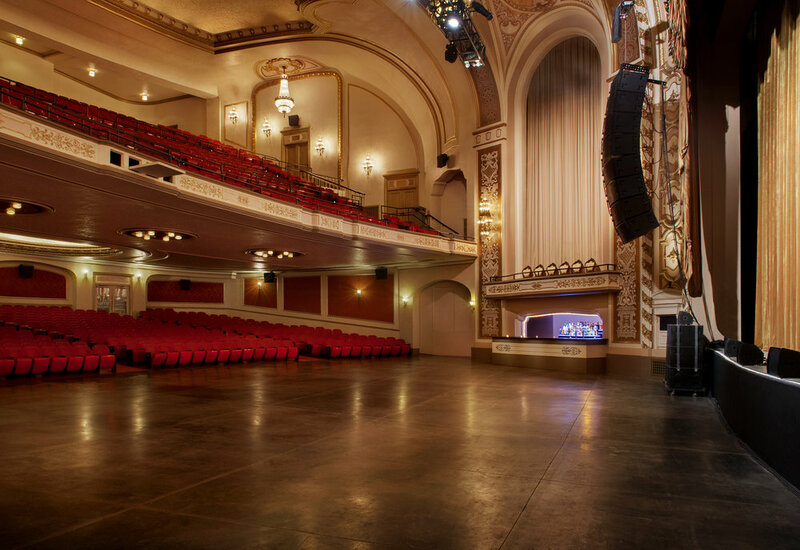 The Orpheum Theater has a few resident ghosts who do a far sight more than merely make you feel ill. For instance, the story of a new night manager that encountered the ghost of a man who had previously held his position. It began when the night manager heard a man and woman conversing at the bar, but upon investigation found nobody to whom the conversation could be attributed. “Watch out for the night manager,” the concerned supervisor was told by theater staff after relating the experience. Later, on a different night, he heard heavy footsteps walking in the hall just outside of the theater. The footsteps were accompanied by the jingling of a handful of keys, as though someone were strolling down the hallway on their nightly rounds. Again, the night manager investigated, only to find no living soul present. This must have been the previous night manager, he decided, still attending to his nightly duties despite no longer dwelling among the living. This phantom manager isn’t the only past employee to make appearances at the theater, according to Lisa. As the story goes, the ghost of a former head usher continues to inhabit the theater after falling to his death from a balcony. Another night manager has claimed to have seen someone “from another time” appear to be sitting in a seat by the theater’s soundboard. This person appears dressed in mid-20th century garb, and disappears soon after being spotted. It’s speculated by theater staff that perhaps the apparition is the poor, dead usher, back from the great beyond to visit the place in which he plunged to his death. There are other odd apparitions, too. We’re told that a well-dressed woman from the 1930s sometimes makes appearances by the bar nearest to the building’s right side entrance. But, like the aforementioned apparition, she disappears as quickly as she is seen. This area also sports a strange red mist that is puzzlingly attributed by theater staff to the spirit of a child. We listen to tale after tale by the talented storyteller, until my writing hand cramps from trying to keep up. We notice then that it’s starting to get late, and, unfortunately, we must part ways. As always, a visit with Lisa has lifted our spirits, and Emily and I head home to happily discuss the intriguing instances of the unusual we have just heard. Lisa is a veritable font of otherworldly information, and she’s given us a generous number of stories about the Orpheum’s haunted history. There’s enough in my journal to help fill out a chapter in a book, I think, which is why it’s a good thing we’re writing one. Naturally, the stories I couldn’t fit here in this feature will make it in there, and in the meantime, catch up with Lisa by going on a tour with Madison Ghost Walks. I’m sure she’d be happy to tell you some of the things I left out, or expound on the stories you’ve just read.